When I started being interested in preparedness, I read everything I could in books and blogs to find out what I need to do. For the purpose of this article, the bug out bag is the one you will take with you to get out of your home in a disaster, not knowing if you are coming back anytime soon. I had the strong desire to prepare all at once, and as soon as possible. Every survival site I read stressed the importance of having a bug out bag, or “get out of dodge” (good) bag. So I jumped in right away. Looking back, I probably should have spent a bit more time researching instead of rushing. Here are some of the most common mistakes with bug out bags. 1. Buying a pack without trying it out thoroughly. I saw this pack that was highly recommended by another website, and it looked like it had a lot of room. The guy who reviewed it said it was a similar style to something the military used, so I figured, they go outdoors a lot so it must be good. And it looked cool. When the bag came in I was fascinated with all the compartments. Then I tried to carry it. The bag weighs about 5 lbs by itself! When you add all the contents it got so huge, and not at all suitable to my small frame. Fortunately, my nephew needed a backpack when he came to visit us. He is 6’2 and built like a football player. The pack fit him just fine so I gave it to him. Lessons for this mistake: Try out a backpack thoroughly before you buy it. Visit a sporting goods store like REI or Academy. Have a salesperson fit you with the right size and shape. Not all bags are built for your stature, and carrying a pack that does not fit will eventually start bothering you. Place weights inside and walk around. These stores actually have bean bags of various weights that they fit in your pack to simulate carrying a full backpack. Walk around the store for 10-15 minutes and see how it feels. I actually got a little sore around the shoulders and legs after trying out so many but eventually, I found the right one. 2. Choosing a bag that is attention-grabbing. In my opinion, the bag should be low-key, in muted colors so it does not attract a lot of attention. If you are trying to evacuate, you don’t want to garner attention from the wrong crowd, who may assume you are someone who has lots of supplies and an easy target. Choose plain brown, black, navy or grey in a nondescript design. Don’t pack items outside that bag that jingle or chime, which also attract attention. Water is one of the top needs for survival and so you need to pack enough of it. You may even have a water purifier or iodine tables but if there is no water source, you are in big trouble. Although the rule of thumb with packing the bag is that it should be a maximum of 1/3 or your weight, that does not mean you will be comfortable carrying your bag. People tend to overpack. To help you plan your bug out bag contents, check out https://bestsurvival.org/bug-out-bag-checklist/. Imagine if you were packing to walk out of the city in dangerous conditions. You don’t want to be over-encumbered at a time like this. Choose your items carefully and reduce weight before anything happens. 5. Not having a bug out bag for the kids. Even though you will end up carrying most of your kids’ supplies, they can still use a small bag where they can store their snacks, small toys or stuffed animal that will give them comfort in an emergency. A couple of weeks ago, I was driving in a busy street when I noticed a guy walking along the sidewalk with a full backpack.. It was early in the morning, but the temperature was already climbing, and the heavy humidity was making it hard to breathe. The guy, appeared to be in his 40s-50s, was dressed in a t-shirt, walking shorts and hiking boots. He was walking briskly, but he did not look like a hitch-hiker or traveler. I figured he had to be getting in shape, either for a backpacking trip, or for a walk out of the city, in case of disaster. I concluded this guy has the right idea, getting in shape before an actual emergency forced him to walk out. Even though getting in shape is not technically having to do with the bag, being able to carry it comfortably is crucial. You should carry a small sewing kit in your bag so you can repair it if a strap breaks or a tear develops. A heavy duty sewing awl would be ideal, but a small sewing kit with enough needles of various sizes will suffice. Make it a point to check the contents of your bag at least every season. Change the clothing to the appropriate season and weed out old items that may have leaked, dried up or expired. Be familiar with all the compartments of your bag and organize it. That way when you need a specific item, you know exactly where to find it. You’ll avoid having to look in each pocket and having to pull out contents. 9. Packing sharp objects without proper covering. Axes, knives, and machetes are often included in bug out bags, either inside or outside. Make sure they are sheathed or at least have the edges wrapped to avoid injuring someone or tearing up the bag. Don’t wait until an emergency or disaster to pack. If you do not want to have a packed bag, make a list of everything you need while you are thinking straight and keep the list in the bag. At the very least have all your items inventoried so you know where everything is. Hopefully, you will never need to utilize a bug-out bag, but if you do, you’ll be glad you put some thought into packing your bag properly. Show kids it’s fun to be prepared, not scared. Good article as always. I think a bug out bag is the first priority for preppers because it makes the most sense, if a disaster requires me to leave, I have the bag, if I get to bug in, then I have the supplies in the bag. I’m still a fan of the alice pack, the medium size, I carried this in basic training and never had an issue, of course I’m 5″8 so those of use who are taller or shorter it may be a bad choice. Another thing that I’ve learned, is to leave space in the bag, whether it’s an extra empty pocket or inside the bag itself, leave extra space. Something else will come up that you need to put in there when a disaster happens, be it extra food, cold weather gear, more water, ect. Hi Pierce, Good to leave that extra space for additional items that come up. I’m glad you mentioned it. Thanks for the comment! Great article. Point is frequently overlooked, too many people buy their gear and throw it in a closet and then forget about it. 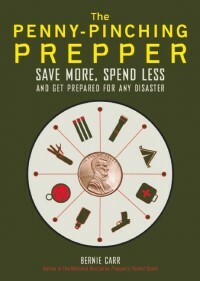 Thanks also for mentioning my Bug Out Bag Planning Tool, I hope your readers find it useful! Hi Chris, The Bug Out Bag Planning Tool is helpful, wish I had the tool when I first started. Thanks for stopping by! I would like to add that you need to rotate out your water, keep fresh and less than a week old water if you can. And check experation dates on food. Packing the bag ahead of time is an obvious necessity, but it’s helpful to place a tag on the bag listing the date and items inside that you want to periodically replace such as the water every six month (to avoid a stale taste ? ), the Gatorade bottle and energy bars every year. These should be reachable anyway so you can get them easily when you’re on the trail. Hi MorrisB, Thanks for the tip about placing a date to remind you to replace some of the contents periodically. A lot of items degrade over time and water does get a mossy taste if left alone for too long. some good common sense advice in this article! however, there are some basic guidelines i would offer. first, the two hardest things to replicate in any wilderness/emergency setting are a cutting tool and a container, so they should be excellent quality and at the core of your b.o.b.. second, being able to properly thermoregulate in any environment is paramount, so a minimum of four ways to make fire or combustion should be in included in your kit, the old adage of” two is one, one is none” rings true here! cover/shelter is also important to thermoregulation, so a good quality tarp or even large 3 mil drum liners are an excellent way to ensure the elements dont wreck you! lastly, but certainly not least, cordage is essential to making shelter, repairs to gear, fishing, hanging food, ect. so paracord, bank line or even cheap jute twine will make your life easier if included. keeeping these items as the core of your bug out bag and building around them keeps your priorities in order and hopefully helps! thanks for the post and keep up the good work! Hi David, There are all great reminders. Two is one and one is one, certainly is good to remember when packing the BOB. Thanks for the comment.